Bluesman extraordinaire Al Basile clearly delivers on his eighth release, Al Basile - The Goods. Joined by an impressive team of Duke Robillard, Brad Hellen, Bruce Bears, Mark Teixeira, Doug James, and The Blind Boys of Alabama - Jimmy Carter, Ben Moore, Joey Williams, Al Basile - The Goods will have blues lovers' scrambling to pick up a copy to add to their collections. Al Basile - The Goods was produced by Duke Robillard on the Sweetspot Records label. Al Basil - The Goods opens with the track The Price (I Got to Pay), which is a tribute to Al's friend, Duke Robillard, which he "originally wrote (this) for Duke, but it was easy to substitute "horn" for "guitar" in the lyric, and while I don't play in front of people every night as the song says, the rest of the lyric captures the attitude - we do pay a price to stay free to play and sing what we want. But willingly." The song captures the dilemma of freedom to play balanced with money to make with his lyrics, "I got places - I got to go, I got people - I have to see, and there's money - I got to make, if I don't - they won't let me be, I just don't know what's in store, so I guess I better make some more, cause there's a price I got to pay - if I want to stay free." Al introduces his track 1.843 Million in his liner notes writing, "I've been re-watching a lot of film noir lately, and this song boils a doomed character's last car chase down to several minutes of musical mayhem in the first person. It was Duke's idea to take the song into the minor on the outro, and we dressed it up with some squealing tires, police sirens, and gunfire to punctuate the grim (and inevitable) denouement. I love to write and sing characters who aren't like me - it's cheaper than going to (or writing for) the theatre." Lie Down in Darkness (Raise Up in Light) is an inspiring song where hope reigns and features backing vocals by The Blind Boys of Alabama. Al writes, "Working with The Blind Boys of Alabama was one of the great experiences of my life - I'm grateful that they found the song appropriate for them. It uses natural imagery and is spiritually uplifting, but isn't overtly religious though the lyrics may be heard that way. I got the idea for the answering voice on the outro in a Memphis hotel room, where I was staying during the Blues Music Awards. I'll take a good idea over an award any day." Al has fun and gets down and playful, with the track, I Want to Put it There, with his opening lyrics, "Can't you hear my bull dog barkin', cooped up in the house all day, if you want to see some happy tail waggin', let ‘im in your yard to play." He writes that this is "double-entendre blues, New Orleans style. I don't even own a dog. It was fun playing a plunger solo and an open solo over that groove, though." Time Can Wait is another catchy tune that dispels the myth that time cannot wait. When love comes around, grab it any age. His lyrics proclaim, "They say time waits for no man, and that's been a problem since time began, That worn-out story keeps getting' told, of how the young get old and the old get cold, Seems like that tide keeps rollin' in, and time marches over me and back again, But I'm here to say it's not too late, When it comes to you darling, time can wait." Al Basile writes with tongue-in-cheek and a twinkle in his eye on Don't Sleep on Santa; and closes out the album with Distant Ships, a song about missed opportunities and the "what-ifs" of life. Other tracks rounding out the album include Along Come the Kid, The Itch, Mr. Graham Bell, She's a Taker, Reality Show, and Pealing Bells. As always, Al delivers what he promises on Al Basile - The Goods. 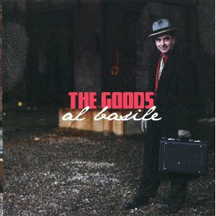 Websites where you can procure Al Basile - The Goods are Al Basile, Amazon, Tower Records, and CD Baby. © May 2011. Luxury Experience. www.LuxuryExperience.com. All rights reserved.